Rarely anyone looks forward to their morning commute which usually involves a lot of traffic and not much else. But earlier this week drivers in Doha were in for quite the scare. 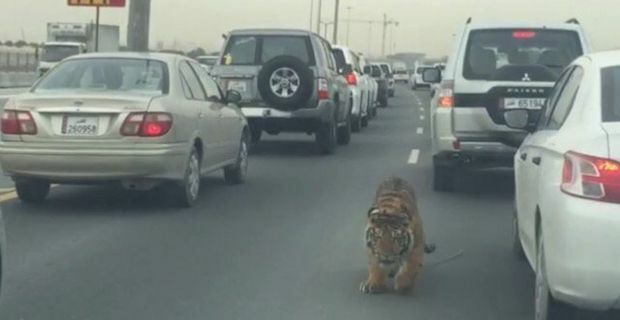 While on Doha Expressway in Qatar, a large tiger made an appearance on what happens to be one of the busiest roads in Doha. Drivers came to a halt when a tiger appeared to have come out of the back of a moving truck in the middle of the highway. A 20-second video of the tiger meandering through cars quickly spread like wildfire and YouTube and Twitter were loving it. Eventually the owner put the tiger back on a lead and ushered him away. It appeared that the tiger had a broken chain attached to its collar giving the impression that this was indeed someone's pet. Even though it is illegal to have large animals such as tigers, lions and cheetahs as pets, many wealthy people in the Gulf countries still have them as a status symbol. The fines for this illegal action can be around £2,000 and up to 6 months in prison. There have been previous incidences of large wild cats escaping their owners in Doha and either injuring or scarring local residents.